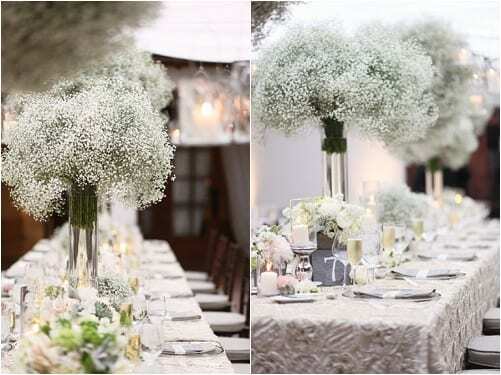 Back in the 1980s, gypsophila or baby’s breath was a very popular filler flower, used in designs to fill the space between large blooms, such as roses and carnations. Kylie even used it to adorn her hair when she married Jason all those years back on Neighbours! Personally, I feel that the big secret to making it look contemporary is to use it massed on its own, and make it the star of the show. The great news for brides is that gypsophila is available all year round, in white, creamy white and occasionally pink….and for the budget-conscious, it’s relatively inexpensive. There seem to be two main trends on the bouquet front. 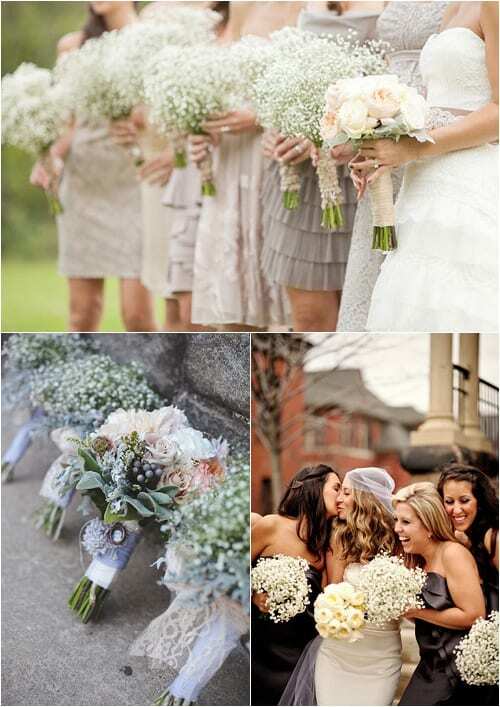 Either the bride opts for a hand-tied bouquet purely of gypsophila as shown above. Or, they’ll have a bouquet of assorted flowers and foliage, with their bridesmaids having gypsophila bouquets, as shown below. 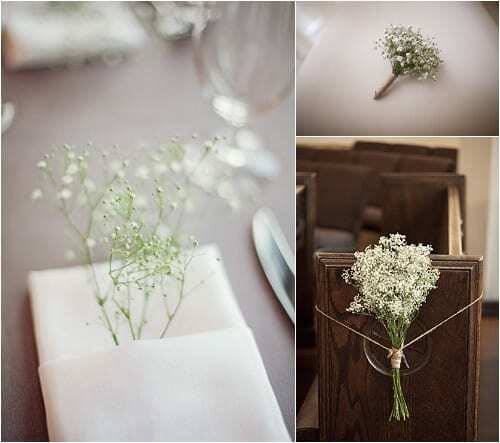 Groom’s buttonholes can be made of gypsophila to co-ordinate with the bridal bouquet. And this dainty flower looks lovely when used for pew ends or napkin decorations. I’m very fond of the growing trend of using hanging jars to decorate wedding venues. And here, baby’s breath looks perfect hung in jam jars from beams, on the backs of chairs or on shepherd’s hooks. So, it looks like it’s time to reconsider this blast from the past. With its dainty tiny blooms, it can look really elegant…and very, very pretty. 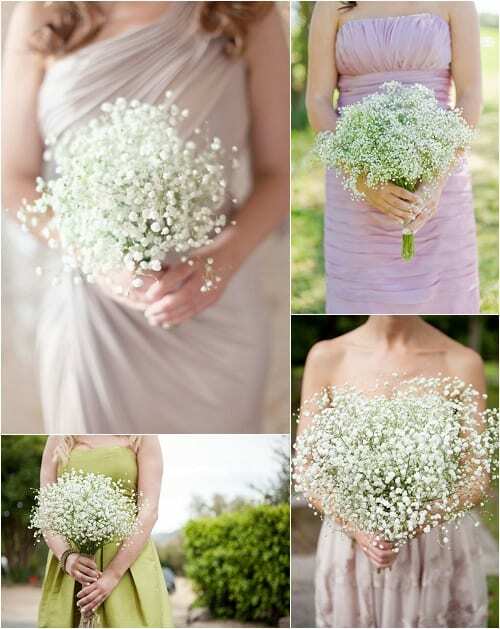 What are your thoughts on including gypsophila in wedding flower designs? P.S. You may remember that I recently wrote a blog post about my visit to the Zita Elze Design Academy where one of the students had used baby’s breath to stunning effect. I totally agree that Gypsophilia is best used en masse and on it’s own. You can also buy it with a glittered effect, though I’ve only seen it available at Christmas time. The glittered effect makes wonderful hanging disco balls so is great for decorating the wedding venue/ dance floor. When I saw your tweet about this post, I wasn’t convinced! I’ve had an extreme dislike for gypsophila ever since I was forced to wear a hideous peach dress and carry a rose and gypsophila bouquet as a bridesmaid. However, I have to admit it looks really beautiful used en-masse and the Groom’s buttonholes are gorgeous. I can imagine it would look lovely in a vase in the home too, a great way to do a large arrangement without breaking the bank. How long does it last? It can be a bit whiffy in large volumes especially on warm days in confined spaces like marquees. Even worse if teamed with eucalyptus. Speak from experience. Quite like smell in small doses. It’s not called Baby’s Breath because of its delicate form more because of its odour. How funny, the wedding I’m working on for this weekend has centerpieces of all baby’s breath. I’m ok with it when it’s used in masses, I do not like it splattered throughout an arrangement. Thank you for popping by Flowerona Alicia…hope all goes well with your preparations for this weekend’s wedding :-). Great write up Rona. 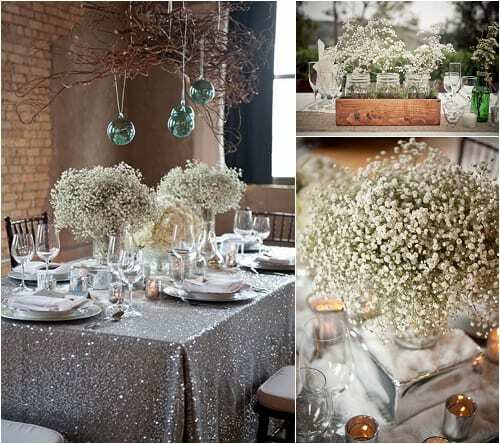 We love Gypsophila although I do think it to make it work as a single element you need to go big if possible. Having said that it’s a great utility flower for filling and adding delicate texture to displays / bouquets containing other flowers. How much gyp does it take to make a wedding bouquet? Helping someone out and need to get some… would appreciate your professional advise. 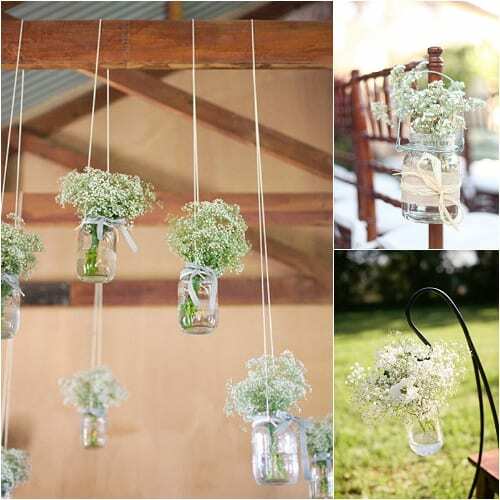 We love the jars with sprigs of gypsophila in them! Please can you tell me, will the flower be easily available in early November?